The factors behind the devastating Queensland floods of December 2010 are threefold, according to a new study that found that not only did Cyclone Tasha and La Niña contribute to the inundation, but so did record-high sea-surface temperatures off northern Australia. Original estimates suggested that La Niña and the cyclone were enough to cause Queensland’s December rainfall to be 154 percent above normal. However, the new calculations behind the study to be published in the journal Geophysical Research Letters revealed that evaporation from the warmer seas to the north and north-west of Australia probably contributed about a quarter of that overall total. Top image shows warmer seas to Australia’s north in December 2010. Bottom image shows rising sea-surface temperature trends over 30 years in neighbouring parts of the Coral Sea, Arafura Sea and Indian Ocean. December 2010 was a horrible month for Queenslanders. Following hot on the heels of an already wet spring, December produced nine floods that affected almost 1.3 million square kilometres of land, caused billions of dollars in damage to agriculture and property (including increasing the price of bananas across the country for the next 18 months. Trust me, that was hard. ), and led to the evacuation of thousands of people across the state. Sadly, 35 deaths were also recorded as a direct result of the floods. The floods were surprising, despite there being active La Niña conditions in the Pacific Ocean which have traditionally enhanced Queensland’s rainfall. The heaviest falls for December 2010 came between December 23 and 28, when moist easterly airflow covered most of Queensland and Cyclone Tasha made landfall south of Cairns. Large parts of eastern Queensland received more than 100 mm of rain and several stations set all-time daily records, with some receiving around 300 mm in one day. Modelling reconstructions showed that on December 14, a low-pressure centre formed off the north-west coast of Australia and moisture-laden air was carried east to New Guinea then south into Queensland, contributing directly to heavy rain between December 23 and 26. 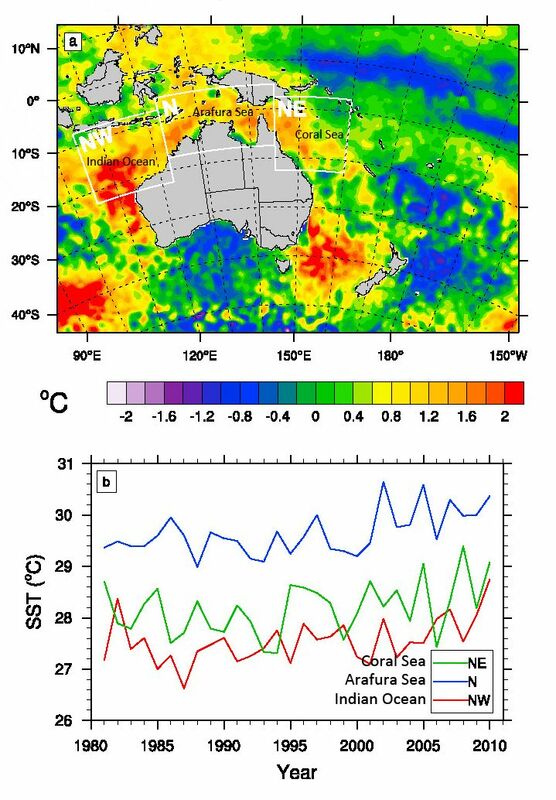 The sea surface temperatures off northern Australia in the Indian Ocean, Arafura Sea, and Coral Sea were unusually high at the time of the floods, by as much as 2 degrees Celsius in some places. “If the observed warming trend in the sea-surface temperatures continues, this result suggests that future La Niña events are more likely to produce extreme precipitation and flooding than is present in the historical record,” says Dr Jason Evans, of the UNSW Climate Change Research Centre. Dr Evans led the study. The study analysed 30 years of historic measurements and identified a general warming trend in the northern seas of at least 0.2 degrees Celsius per decade. The researchers however made clear to note that this was the strongest La Niña event during the current satellite record, but that there may have been similarly extreme events prior to when record keeping began.